A Proxy Server provides a number of useful functions in a company’s network infrastructure. Proxy Servers will go out and retrieve Web pages and content and return the Web pages to the internal network users. The fact that the proxy is retrieving the Web pages and not the actual clients adds an extra layer of protection to the clients because their internal IP addresses are hidden from the Internet. The proxy mechanism makes surfing external Web sites safer for internal clients. If employees are constantly requesting pages from the same Web sites, the proxy server can store those requests locally on the server. When additional requests are made for content that has already been retrieved and stored locally, the proxy server will send the requesting client the copies of the pages from its stored cache. Utilizing this function, a proxy server will not have to go back out again and fetch the requested Web pages. Forefront TMG 2010 can be configured to act as a proxy server in your environment to accelerate the performance of Internet access, as the name implies. 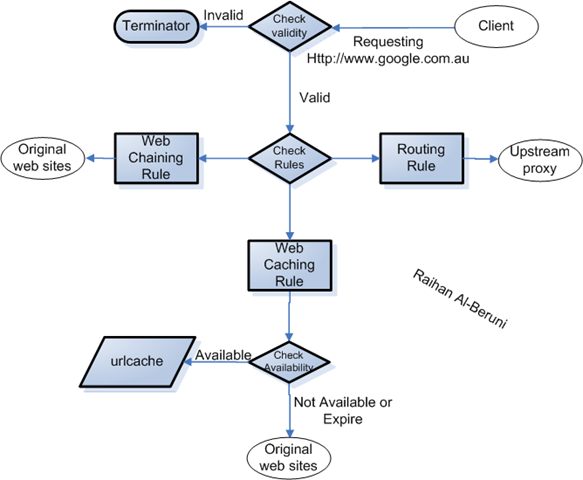 In the following flow chart shows how TMG perform Proxy Cache. 1. Forefront TMG 2010 checks whether the object is valid. If the object is valid, Forefront TMG 2010 retrieves the object from the cache and returns it to the user. 2. If the object is invalid, Forefront TMG 2010 checks the Web Chaining rules. 3. 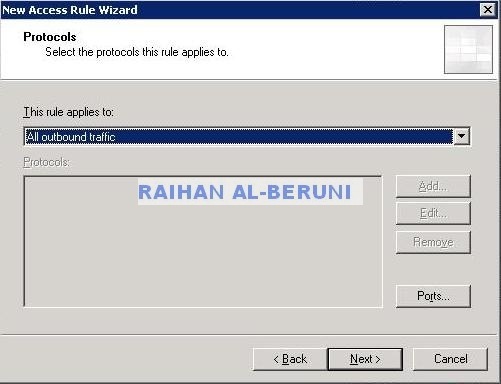 If a Web Chaining rule matches the request, Forefront TMG 2010 performs the action specified by the Web Chaining rule; for example, route the requested directly to a specified Web server, an upstream proxy, an alternate specified server. 4. 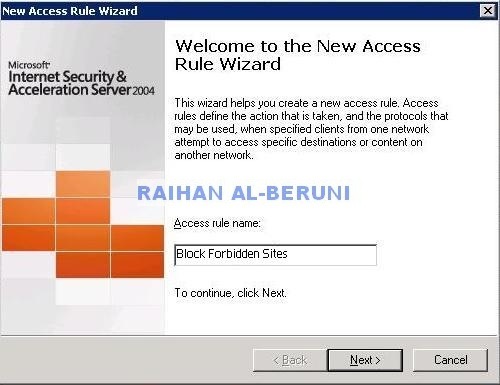 If the Web Chaining rule is configured to route the request to a Web server, Forefront TMG 2010 determines whether the Web server is accessible. 5. If the Web server is not accessible, Forefront TMG 2010 determines whether the cache was configured to return expired objects. 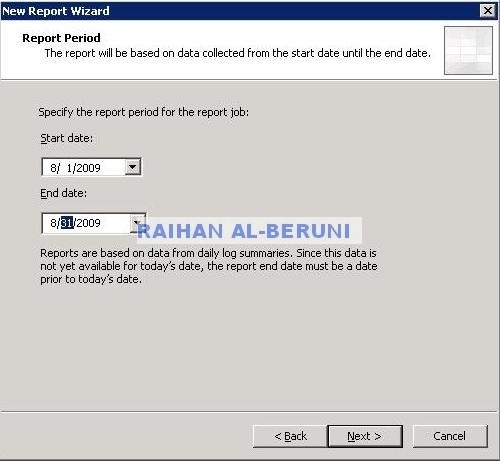 If the cache was configured to allow Forefront TMG 2010 to return an expired object as long as a specific maximum expiration time hasn’t passed, the object is returned from the cache to the end user. 6. 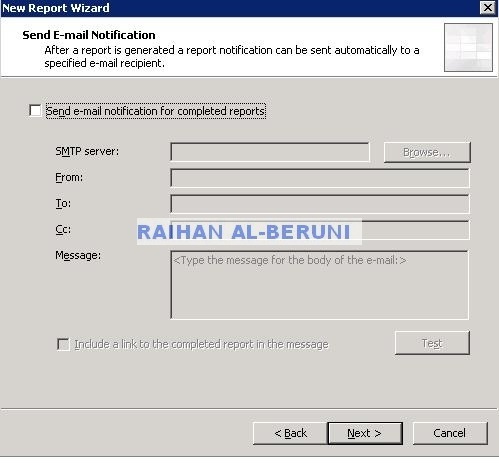 If the Web server is available, Forefront TMG 2010 determines whether the object may be cached depending on whether the cache rule is set to cache the response. 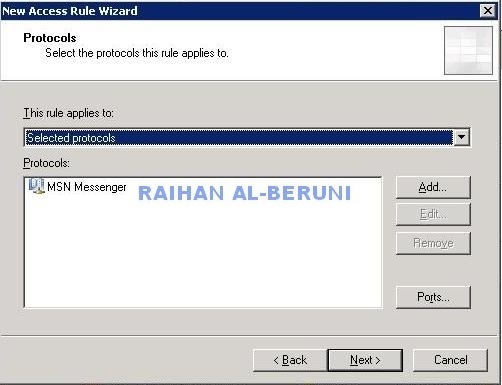 If it is, Forefront TMG 2010 caches the object and returns the object to the end user. Forward Caching: To cache all Internet traffic from external to internal. That’s all Internet pages requested by internal users. works with publishing to help offloading the published server. 3.In the right pane under the Tasks tab, scroll down and click on Web Proxy. Check enable web proxy client connections for this network. 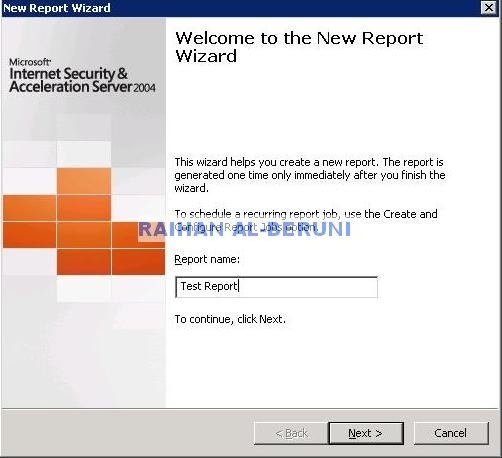 Check Enable HTTP and type port 80 or if you want to use web proxy port 8080 then type port 8080. 4. Click on Authentication, Select integrated. Click ok.
5. 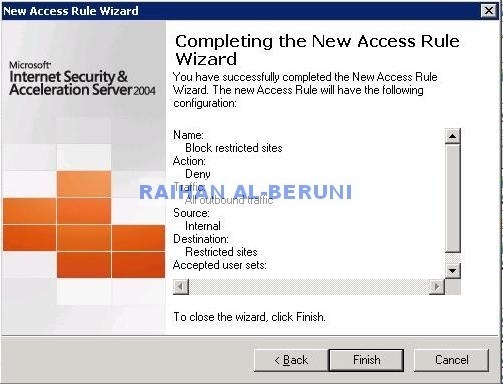 Click on Advanced, select unlimited Click ok.
6. Now click on Apply and ok.
7. Click on Configure Web Caching , You’ll see the Cache Settings dialog box. 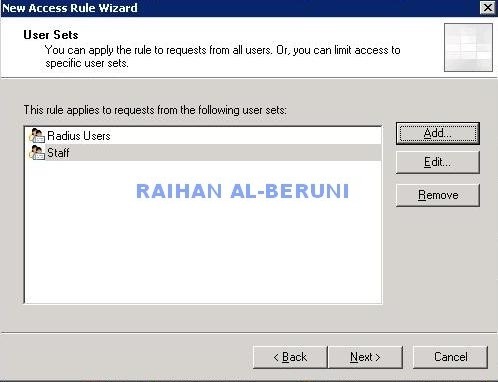 Click the Cache Drives tab to access the Forefront TMG 2010 cache storage configuration. 3. Click Configure to define the cache size and location. 4.To define the cache location and size, select the non system partition where you want to store the cache file and enter the desired size of the cache file in the Maximum Cache Size (64000MB) text box. Click Set and then click OK to close the Cache Settings window. 6. click Apply to apply changes. 5. Type Name of the URL sets (For Example Microsoft Update). Click on Add and type URL. Repeat it and the following urls. 6. Click Ok. Now you will see Microsoft Update URL set. Select Microsoft Update URL set. Click Add and Click close to close URL sets. 7. Click Next. Select “If a valid version of the object exist in the cache. If no valid version exists. Route the request to the server”. Click Next. 9. In the Cache Advance Configuration Window, Check Do not cache object larger then 1GB or your preference but remember you have 64GB cache size. Check Cache SSL response. Click next. 12. Click Finish. Apply Changes. Users spending hours watching video and downloading mp3!!! 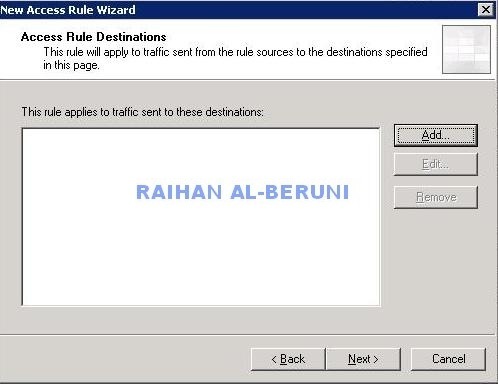 Here is the way, you can ban those sites that are bandwidth hungry. You can add a policy in your ISA server and apply. This will save lots of download limit and speed up your internet during peak hours. here you can add your desired group of users you want to ban, I added All Users. Click finish and apply. 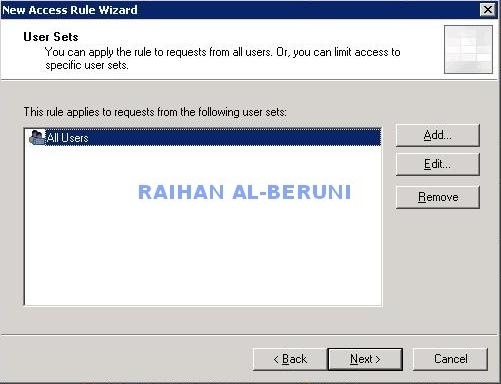 Log on to any computer using a test user placed in above mentioned group and browse restricted site. you will see it is blocked by proxy. To block messenger using Microsoft ISA server, you need to create a deny policy in ISA server. Here is the tips. Remove All Users and add desired group, you want to block.